We are expected to live longer. Good news, yes, but aging comes with many challenges and fears, chief among them is an increased risk of developing dementia. With that in mind, here’s how one Kendal committee helps residents learn about Alzheimer’s and dementia. According to the Alzheimer’s Association, one in 10 people age 65 and older has Alzheimer's dementia. 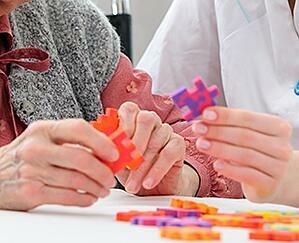 As the number of older Americans multiplies, so too will the numbers of new and existing cases of Alzheimer's. 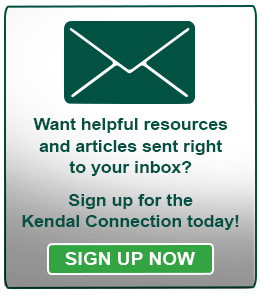 “It's particularly scary for people at Kendal because many of us do have academic backgrounds and so the loss of the thing that we've always prided ourselves on, such as our cognitive ability, is particularly scary,” says Elizabeth Hole, chair of the Thoughtful Health Conversations sub-committee. The committee is trying to face this fear through a book club and an ongoing discussion group, examining ways to make Kendal more dementia-friendly. So far, about 125 residents and staff have been involved in one of three book discussions: Dancing with Dementia, My Story of Living Positively with Dementia, by Christine Bryden; Dementia Beyond Disease: Enhancing Well-Being, by G. Allen Power; and Love in the Land of Dementia: Finding Hope in the Caregiver’s Journey, by Deborah Shouse. “Book clubs are a good way to work with this community,” Elizabeth says. The Dementia Friendly Discussion Group (formerly the Stop, Look and Listen forum) has offered 1-hour training workshops for residents, staff and Oberlin College students. Some of the suggestions shared at the workshop come from interviews with residents with dementia. “I go around with my dog Spirit who's a little Sheltie, and I learned very quickly not to say, ‘What was your dog's name?’, but rather, ‘Did you have special things you did with your dog?’” Elizabeth says. In addition to taking Spirit to visit residents living in the Stephens Care Center, Elizabeth and the dog are now making weekly trips to the Jameson House, a newly opened 12-bedroom small house community for people with mild to moderate cognitive changes. 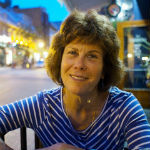 Earlier this year Tracey Lind, former Dean of Cleveland’s Episcopal Trinity Cathedral, spoke at Kendal about her diagnosis of Frontotemporal Dementia (FTD), a dementia that affects communication and language, mobility and memory. “I am learning to love the person I did not recognize,” the 63-year-old woman told the overflow crowd. Tracey offered these suggestions for those caring for a loved one with dementia. If you suspect a loved one has signs of dementia, encourage seeing a doctor, as early diagnosis can improve one’s quality of life. Denial is not useful, honesty is. Show respect, and don’t be put off if the person is sitting in a wheelchair, drooling and hugging a teddy bear. These initiatives and the committee’s outreach seem to be making a positive difference at Kendal. A resident recently told Elizabeth that a lunch gathering ebbed and flowed, as residents with and without dementia moved to and from a dining room table to eat. “It just feels like people are becoming extremely comfortable,” the resident told Elizabeth. And finally, don’t avoid or ignore people with dementia, which is one of the things people most fear about the disease. “It's much more important to make a few mistakes but try, than to say, well, I'm not going to make any mistakes and not try. I think the most important thing is to remember that we're all people and that we have very common needs,” she says. Jameson House recently opened to residents with mild to moderate cognitive changes. The house was designed with comfort, safety, and creativity in mind. It can house 12 residents at a time and includes a circular path with an outdoor courtyard in the middle. The courtyard includes a sensory garden, featuring a water fountain, herb garden and dining area.